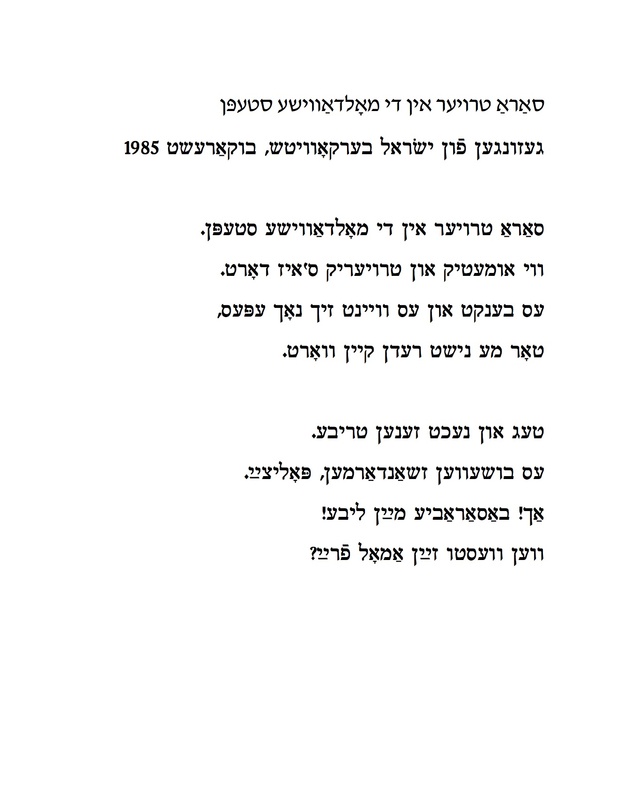 The singer of Sara troyer, a Romanian Yiddish partisan song from the second world war, is the Yiddish poet Israel Berkovitch (Israil Berovici). He was born in 1921 in Botoshan, Moldavia and died in Bucharest in 1988. He directed the Jewish State Theater of Bucharest, a Yiddish theater which still exists, for many years. For more on his life, see Dr. Elvira Grozinger‘s essay from the book Under the Red Banner at this link. His archives are at the University of Potsdam, Germany. In 1985, I traveled to Romania with my parents to visit ‟the old country‟, and particularly my father‘s hometown Siret. At that time, we still had relatives living in Bucharest and Suceava. While in Bucharest we were able to get together with some of the Yiddish writers and activists living there then: writer Chaim Goldenstein, journalist and translator Anton Celaru (Yosl Faierstein) and Israel Berkovitch. At one get-together, I believe at the Berkovitches apartment, I asked if someone knew Yiddish songs, and Berkovitch took me to a back room, so no one else would hear, and sang this song for me. Ceausescu was still the dictator then, and everyone in Bucharest was very wary of everything, so I guess he didn‘t want others to know about the song. I have not found any other information on the song or variants. Sara troyer in di Moldavishe stepn. Vi umetik un troyerik s‘iz dort. tor me nisht redn keyn vort. Such a sadness in the Moldavian steppes. How lonesome and gloomy it is there. but not one word is allowed to be spoken. Teg un nekht zenen tribe. Ven vestu zayn amol fray? Gendarmes and police run rampant. When will you ever by free?